Meet nine unforgettable girls in the groundbreaking film that launched a global movement for girls’ education. Prize-winning authors put the girls’ stories into words; renowned actors give them voice. Academy Award® winners Cate Blanchett, Meryl Streep, Anne Hathaway and others perform in Girl Rising, arriving on DVD March 4. Now everyone can bring home “the documentary every mother, sister, daughter should see, as well as the men who love and support them” (Entertainment Weekly). Parents can engage both daughters and sons with the inspirational film that points the way toward global citizenship. The DVD contains the feature length film and much more – behind the scenes footage, interviews with the writers, engaging short videos and a director’s introduction. 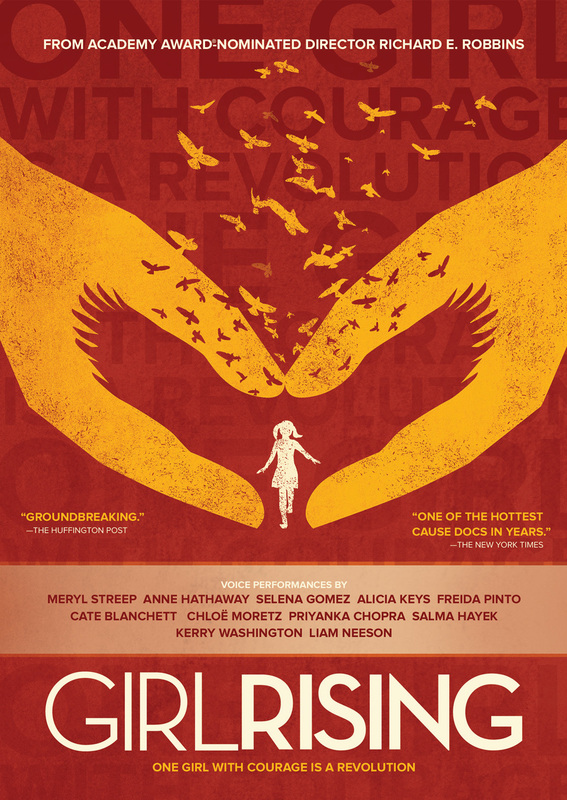 Girl Rising was released in March, 2013 and made its highly celebrated broadcast premiere on CNN on June 15, 2013. More than 205 million people have seen Girl Rising on television, at private events, and in 8,000+ screenings around the world. From a rally at the World Bank to a conference in Kuala Lumpur to high-level screenings worldwide – at UNESCO, the Irish Parliament, the Pentagon, the Peace Corps and an ever-growing list – Girl Rising consistently engages the attention of global influencers, and supported more than 1,800 events for International Day of the Girl in October, 2013. The film The New York Times calls “One of the hottest cause docs in years,” is the heart of a global action campaign for girls’ education that promotes this powerful truth: educating girls in the developing world can transform families, communities, and entire countries – and break the cycle of poverty in just one generation. For more information about how to be a part of the Girl Rising movement, visit girlrising.com. From Academy Award nominated director Richard E. Robbins, Girl Rising spotlights the remarkable stories of nine girls living in the developing world, striving beyond circumstance and overcoming nearly insurmountable odds to achieve their dreams. The narration talents of renowned actors and the moving words of prize-winning authors combine and give voice to the girls’ stories and this powerful truth: educating girls can transform families, communities, countries and eventually, the world. Featuring Anne Hathaway, Cate Blanchett, Selena Gomez, Liam Neeson, Priyanka Chopra, Chloe Grace Moretz, Freida Pinto, Salma Hayek, Meryl Streep, Alicia Keys and Kerry Washington.